"We are currently using the hoods [18" Wide Portable Clean Room Hoods] in Veterinary and Physician offices to separate stem cells from fat tissue. The doctors need something that is portable, light weight and requires minimal space. 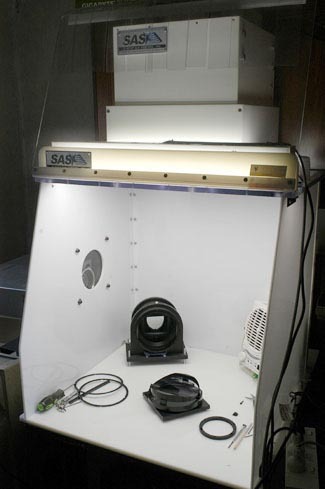 The Sentry Air Systems portable cleanroom hood allows us to ensure sterility of the samples we produce." Stemlogix is a regenerative medicine company committed to providing Veterinarians with the ability to deliver the most viable and potent stem cell therapy possible to dogs, cats and horses at the point-of-care. 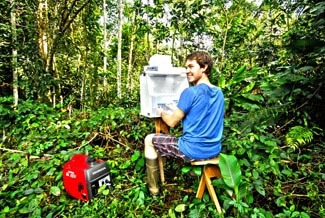 "We are using your portable laminar flow hood to work with fungi living inside tropical plant tissues; it's amazing to create a sterile workspace in a notoriously microbe-ridden environment like the Peruvian Amazon." "My business is the design and assembly of ultra high quality XEIT brand anamorphic cinema projection lenses. One of the critical quality benchmarks is to keep microscopic dust contamination of internal surfaces to a minimum. As I could not justify, and did not need a full "clean room", I picked a Sentry Air SS-324-PCR (24" model) to provide the "clean" environment I needed, where I needed it. My lens assembly has been designed so that once it is assembled and sealed it can be removed from the clean bench-top area and calibrated in a normal room atmosphere, secure in the knowledge that the assembly sealed inside the SS-324-PCR, will remain internally dust-free. Lastly, the SS-324-PCR is light enough and small enough to pack inside an ordinary SUV for transport to any new workshop location that I may relocate to in the future. It is easy to assemble, clean and remarkably sturdy in construction: an eminently practical solution, where space and cost considerations do not permit a full "clean room" set-up. I have not seen another unit like the SS-324-PCR anywhere, from any manufacturer, that incorporates such light weight, easy access, portability and reasonable cost. I have had great success with the SS-324-PCR and commend Sentry air for their product, their prompt service, and their product support."